The croissant, a French classic with a crescent shape, consists of layers of pastry dough, made flaky and light with creamy butter. It's a melt-in-your-mouth pastry that makes the perfect accompaniment to a steaming cup of hot coffee in the morning. However, you might want to save it for a special treat, as croissants are high in calories and loaded with fat. A mini butter croissant has about 114 calories, while a small has about 171 calories and a medium has about 231 calories. 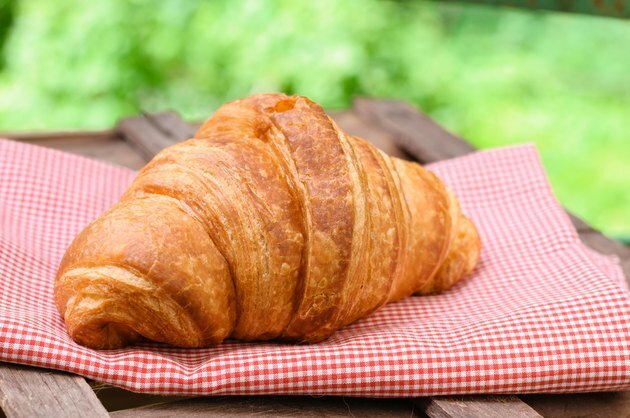 If you go for the largest butter croissant, you'll consume about 272 calories. The calorie count is just for the pastry alone. You'll consume significantly more calories if you smear on butter, preserves or honey. Not all croissants are created equal. They're also available with a variety of fillings. A cheese croissant will have anywhere from 174 to 277 calories, while an apple croissant will cost you around 145 calories for a medium pastry. How Many Calories Does a Cannoli Have?